Mwahaha xD lol I'm first! It's okay, but eh I don't especailly attach to it. Hey, it's really nice. 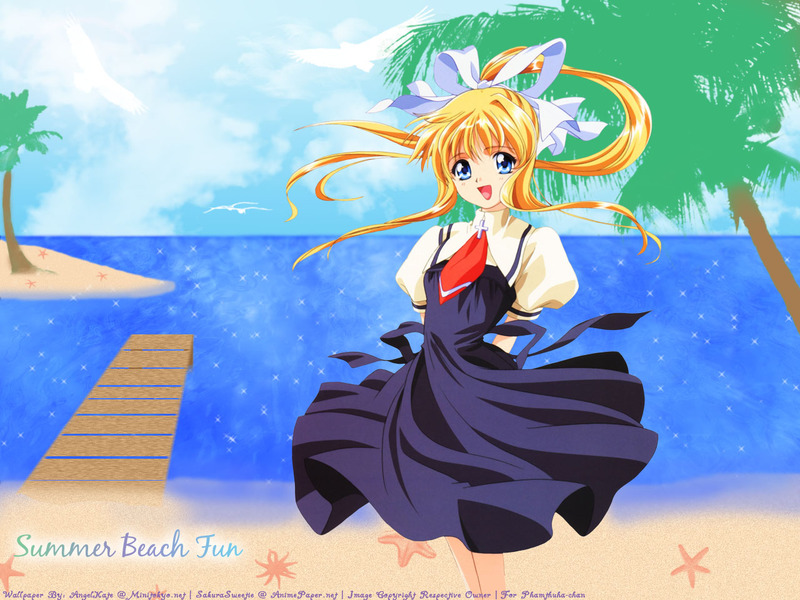 The summer scene is just great and the girl is cute. Fav from me and add to CW gallery >_< Keep it up, angelkate-chan! i think this looks nice kate ^______^ it looks happy and has a breezy mood with her hair flowing around and stuff <3 love misuzu~ i think the leaves on the tree needs some shading.. but everything else is beautiful! Cool wallie Kate-Chan! the background is really pretty and suits well with the scan! Pretty wallpaper ^O^. Fav from me ^^, of couse ^^. oh the is really pretty. nice job with the background. Tha sand look beautiful too! And I like the sparkles on the water. That is amazing that you did find palm tree leaves. They look so cool here. Since you sincerely want to get better with your walling and you are such a sweet friend, I figure I could offer some tips to help you, no? Any joe smoe can say how wonderful a wall is and dismiss the fact that you want to improve, but it takes one who cares to give advice to help the other to learn and expand. So I agree with Nami-Neko with some pointers there so you can become a great waller--which you are definitely on your way. I hope this helps, girl *hugs* You show so much potential in this wall and how you really want to better yourself. That is so refreshing to see and encouraging too. Nicely done, AngelKate this AIR wallpaper looks beautifual. All of your wallpaper looks Intresting/nice/Beautiful ^^ Keep up the good work. Neat! You're good at making simple backgrounds work. My one complaint is with the tree at the right- it comes into the picture at a very odd angle. Palm trees of that height usually don't lean that much- you can google "palm tree images" for some examples. My suggestion would be either stand the tree up straighter, or if you're determined to make that lean believable, add some "droop" to the trunk and branches. I liked the rest of it though, especially the water/beach. P.S. Do you remember where the scan's from? I'd love to see it, it's just a really "fun" picture! fantastic scan! very kawaii. i love the colors, they are so bright. keep them coming please! I agree with pretty much everything else said here, leaves need some texture. Otherwise I like how you played everything out. It is winter...I don't care what the title suggests...I need some Ice Cream...! Good idea using beach as the theme...after all...Air taks place in summer...a winter wall will be weird...nice brush with the cloud...the background is abit...cartoonish...? I love Air so it is a fav no matter what...but I was looking forward to some nice background...oh well...if you have the chance you should watch it...happen to own both the soundtrack and the anime....oh yeah by the way...which track of Tsubasa is good...I just got it...hehe...hope you do more Air related works...! luv the concept here...it's very summery and tropical! and the composition is quite wonderful, as well...i luv that island off to the side and the boardwalk. but i think your tree trunks need some texturing. overall, your wallie is very sweet and has a nice, pleasant atmosphere!